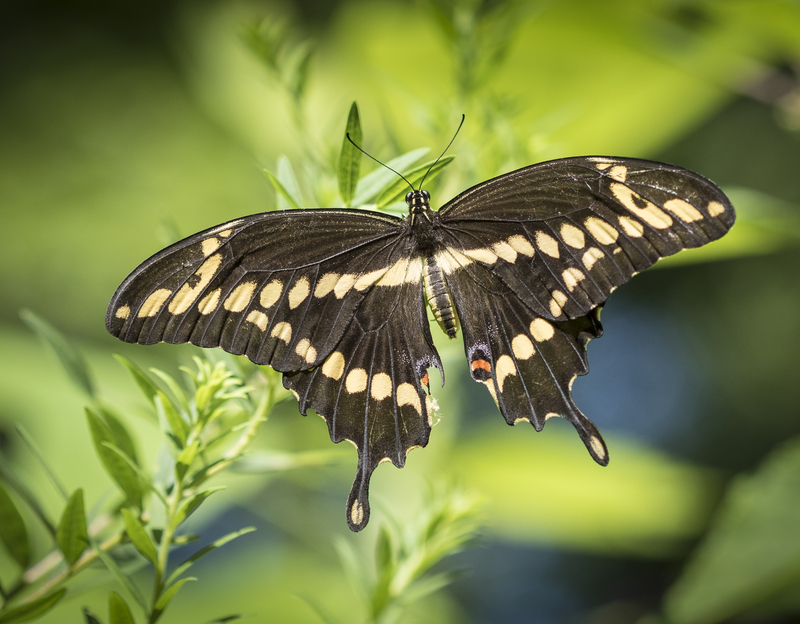 I have been enjoying all the Eastern tiger swallowtails in the yard these past few weeks, along with the antics of the hummingbirds at the feeders and wildflowers. Living in a house of windows has its advantages as I can easily keep an eye on all the comings and goings in the yard as I walk from room to room. This morning, something caught my eye and my brain registered a flash of surprise. I saw a large, dark-colored butterfly, wavering at various flowers, at each one for just a second or two. But the undersides of its wings were mainly yellow, quite different from the dark morph Eastern tiger swallowtail females I usually see. From somewhere in my field guide memory banks, the ID came rushing out – a giant swallowtail in the yard! I have never seen one of these beauties in North Carolina (I vaguely remember seeing one in Florida, where they are much more common). I grabbed my camera and went outside to document it, but found it frustratingly elusive. 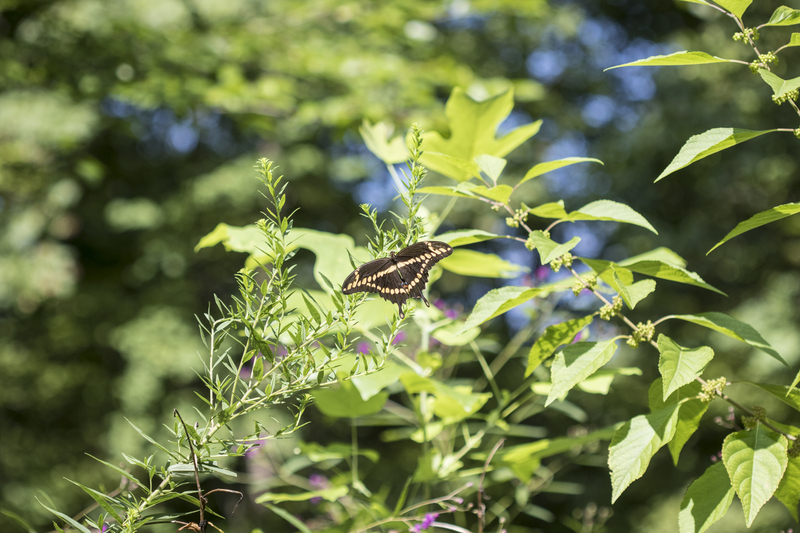 It was in constant motion, visiting various flowers (mainly garden phlox, Joe-Pye weed, and ironweed) for only a few seconds before fluttering on. After my brief time with this species, I definitely agree with Jeff Pippen’s summary of giant swallowtails on his web site – Giant Swallowtails are notoriously challenging to photograph with a point-and-shoot style camera because they stay in constant motion while nectaring, fluttering their forewings for balance rather than perching. After following it around the yard for a few minutes, I was delighted when it landed on a tall goldenrod and spread its wings to soak up some sun. I grabbed a couple of photos from afar (I had my macro lens on, so not much for telephoto shots), and then crept closer. I finally managed a couple of pics from a few feet away, highlighting its bold yellow and black marking on its dorsal surface. And then, in an instant, it was gone. I had gone inside to walk through the house to get a closer view, but when we went out the front door, it was nowhere to be seen. I went inside to look it up on the Biodiversity Project of NC butterfly web site and saw that this species is uncommon and local along our coast and very rare and local in a few spots in our foothills and low mountains. It is considered extremely rare to very rare in the Piedmont. The reason is that the host plants are in the rue family (Rutaceae). What this means for NC is prickly-ash along the coast and hoptree at scattered inland sites. It also will lay eggs on cultivated citrus plants in our state and is considered a pest in citrus-growing regions of Florida ad elsewhere. The records for Piedmont NC (and I think this may be a new record for Chatham County) are almost all believed to be migratory individuals or localized numbers associated with potted citrus plants. Whatever the reason, I am happy this one butterfly paid us a surprise visit this morning. 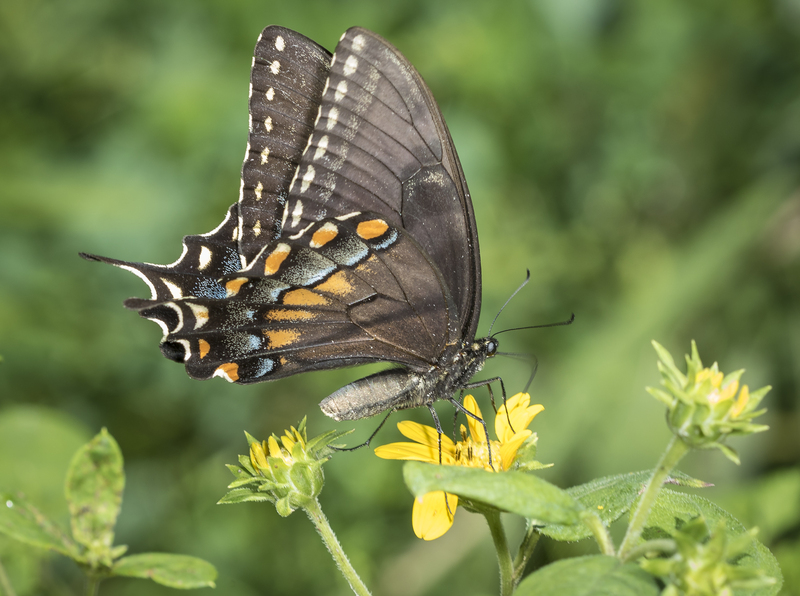 This entry was posted in Natural History and tagged Giant swallowtail, nature near home by roadsendnaturalist. Bookmark the permalink. Wow! What a treasure. Thanks for sharing. Pure luck I happened to look out while it was in the yard because it vanished after a few minutes. You must be living right!! Very happy for you that your yard was chosen! I also had a surprise visitor last Sunday afternoon on a butterfly bush in Ashe county, a giant Swallowtail. With the help of a friend we reported it to the state registry. Your photos are wonderful, my friend’s cell photos were not so sharp. County, we have a cabin along the New River at Glendale Springs next the Blue Ridge Parkway. Sorry, wasn’t sure my first comment would post. Wow, sounds great! Interesting distribution on this species. Your Giant Swallowtail probably hatched of off Poncirus trifoliata, trifoliate orange, a rutaceous plant and a recent invader of high floodplain in the Piedmont. Nice record, though. Enjoy your blog. 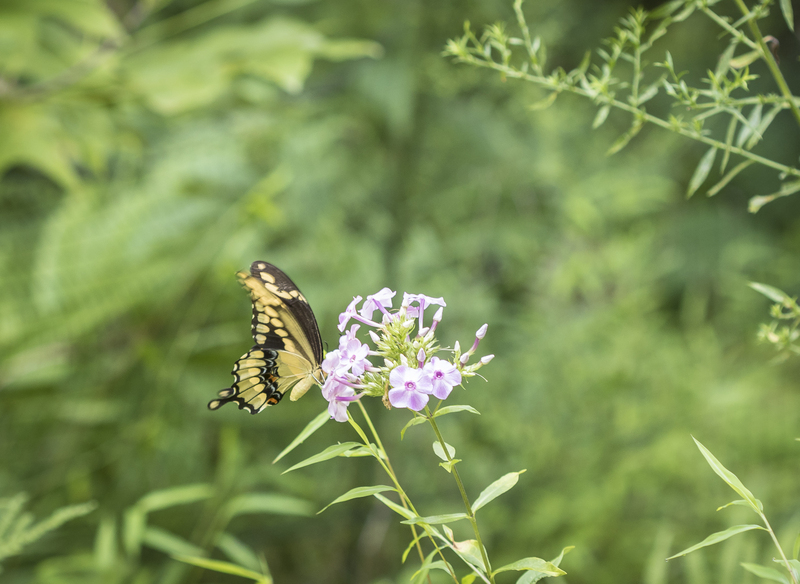 Thanks for sharing, we had a special visitor, Giant Swallowtail , last Sunday in Ashe county on my butterfly bush near the New River. A friend helped me post it on the state register. Still thrilled with this “rare” visit ! Wow, thanks for sharing this info and beautiful photos! I always learn something new from your blog, Mike!